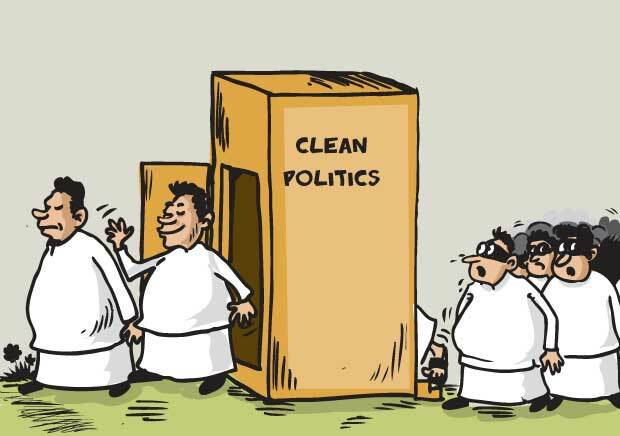 With the main political parties intensifying their campaign for the February 10 local council elections which will clearly show the mood and pulse of the people, President Maithripala Sirisena -- party politics apart -- appears to be going all out in his battle for clean politics. The President, in yet another hard hitting speech at a rally in the historic city of Kandy on Monday directly appealed to Prime Minister Ranil Wickremesinghe and members of all parties to cooperate with him in his crusade for clean politics and to bring the alleged racketeers to justice. His comments came amid reports of differences between the United National Party (UNP) and the Sri Lanka Freedom Party (SLFP), the partners in the National Unity or consensus government. On December 30, the President received the lengthy report of the Presidential Commission, which probed the alleged bond scam at the Central Bank from February 2015 to March 2016. Mr. Sirisena had earlier received a long report from the Presidential Commission of inquiry into serious acts of fraud, corruption and abuse of power, state resources and privileges (PRECIFAC). Both reports were tabled in Parliament on Tuesday and a party leaders meeting was held to decide on a date for a debate. According to reports, the PRECIFAC among other cases has recommended that legal action be filed against former President Mahinda Rajapaksa and former Defence Secretary Gotabaya Rajapaksa. The President’s Kandy speech came after some UNP back benchers criticised him on certain matters relating to the bond commission report while SLFP ministers also criticised the Prime Minister for appointing Arjuna Mahendran as Central Bank Governor in January 2015. Political analysts said the Prime Minister and the President have appealed to members of both parties to stop their criticism and a truce appears to be prevailing. According to reports, the President virtually walked out of last week’s Cabinet meeting after expressing concern over critical remarks made by some UNP members. The President is reported to have said he told the Prime Minister not to appoint Mr. Mahendran as Central Bank Governor and not to appoint Ravi Karunanayake as Minister of Finance. But he lamented that the Prime Minister had not listened to him and now the government and the country were embroiled in the bond crisis. Later the Prime Minister and other ministers are reported to have persuaded the President to come back to the Cabinet meeting where the other matters were taken up. The next day, the UNP working committee met and the Prime Minster is reported to have given stern orders that no UNP member should criticise the President. Mr. Sirisena is also reported to have told his ministers and MPs not to be critical of the Prime Minister or other UNP members specially on the bond issue. President and the Prime Minister have assured that the reports of both commissions have been submitted to the Attorney General’s Department and investigative agencies for more evidence to be gathered and court cases to be filed expeditiously. The new Justice Minister Thalatha Athukorala, acting on the advice of the President and the Premier has also finalised legislation to appoint three special three-judge high courts to hear corruption cases. The high court will meet daily and conduct hearings in the morning and the evening so that the cases could be completed within months. The first Presidential Commission has reportedly spotlighted 34 cases involving political VIPs and officials. On February 10, Sri Lanka’s people will give their verdict on what has happened or what has not happened. We hope stability will prevail and the new municipal, urban councils and Pradeshiya Sabhas could also get involved in sustainable, eco-friendly and all-inclusive development of our country.